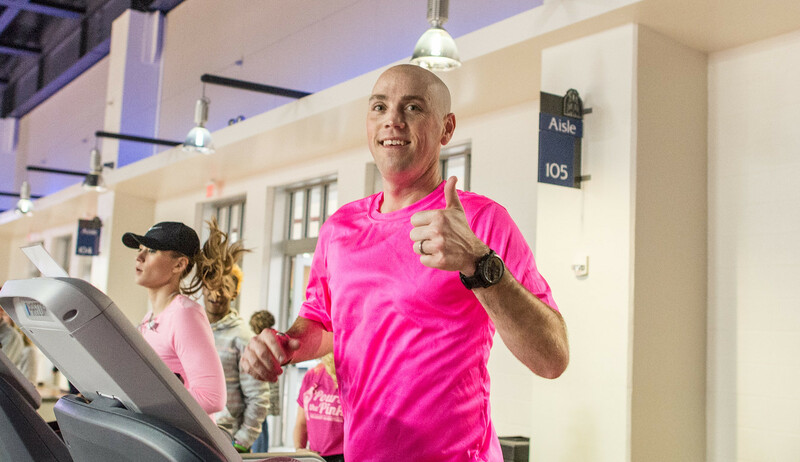 Ultra-marathon runner Jason Eads, husband of Associate Athletic Director/Senior Woman Administrator Lauren Eads, participated for the second year in Belmont’s “Pour on the Pink” day by running on a treadmill non-stop throughout both women’s and men’s basketball games on Feb. 6. This year faculty, staff and students were invited to join Eads by running on a second treadmill in 20-minute intervals. Attendees of the game could donate $1 to guess the total mileage ran by all runners that afternoon, with all donations going to Susan G. Komen for breast cancer research, education, assistance and advocacy. Participants on the second treadmill included Debbie Chenoweth, Jeffery Burgin, Olivia Miller, Antonio (dressed as BelMedea), Komen Executive Director Patty Harman, Jamie Zeller, Mary Mancin, Mark Carr, Chris Kuhlmeyer, Karlee Lursen, Sam Stolte and Kim Carr. The final mileage for the “Guess the Mileage” contest at the 5 minute mark of the second half of the men’s game was 43.7. Eads ran 27.6, and participants on the second treadmill ran 16.1. Eads continued to run until the end of the game to cover a total of 30 miles even. Click here to view additional photos from the event.